‧ ESS ES9018K2M SABRE32 Reference Stereo DAC : Audiophile-grade (DSD /2.8M, 5.6M, 11.2M supports) 32bit 384kHz DAC Chip. The SABRE-2M DAC is an audiophile-grade high-performance 384kHz, 2-channel audio D/A converter designed for audio pre-amplifiers and A/V receivers, as well as professional applications such as recording systems, mixer consoles and digital audio workstations. With ESS patented 384kHz Hyperstream? 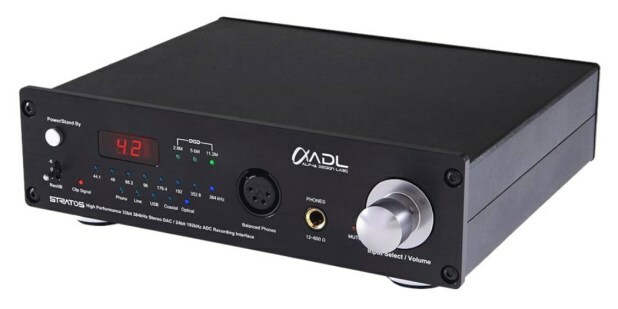 DAC architecture and Time Domain Jitter Eliminator, the SABRE32 Reference Stereo DAC delivers an unprecedented DNR of up to 135dB and THD+N of -120dB, the industry’s highest performance level that will satisfy the most demanding audio enthusiasts. 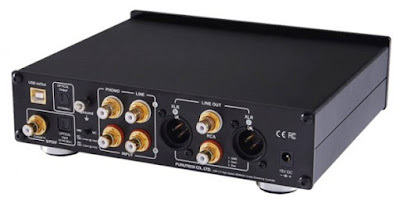 ‧Ultimate high-end grade linear volume control: 2-channel electronic volume allowing the volume to be preset for each input (Phono, Line, USB): The MUSES72320 is a ±18V operation 2-channel electronic volume, which is optimized for high-end audio and professional audio applications with advanced circuitry and layout. The MUSES72320 performs low noise and low distortion characteristics and with resistance ladder circuit. ‧ Optical S/PDIF output (for USB, Optical and Coaxial) 24bit/192kHz Max. ‧Convenient Clip signal Toggle switch for Recording Attenuation: Adjust the recording attenuation to avoid any distortion during recording: -6dB, 0dB or +6dB (Rec/db signal light comes on when input level exceeds circuit Gain). Power supply-1: 5V DC from USB bus powered USB chip only. Power supply-2: External AC/DC Switching Adaptor output DC 15V / 800mA / 12W provides power needed for high resolution audio via LINE, PHONO, COAXIAL, OPTICAL inputs (The STRATOS also excels as a standalone DAC digital amplifier when not playing computer based files via USB).